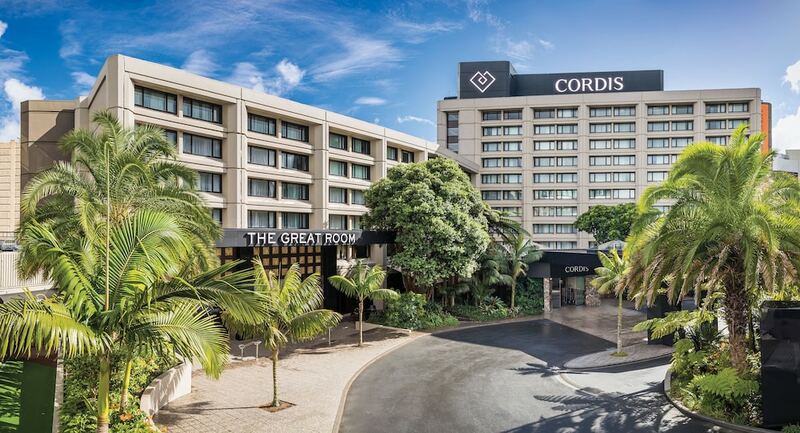 With a stay at Cordis, Auckland by Langham Hospitality Group, you'll be centrally located in Auckland, just a 4-minute walk from Queen Street Shopping District and 12 minutes by foot from The Civic. This 5-star hotel is 0.6 mi (0.9 km) from Auckland City Hospital and 0.6 mi (1 km) from Aotea Centre. Make yourself at home in one of the 411 air-conditioned rooms featuring refrigerators and LED televisions. Satellite programming and MP3 docking stations are provided for your entertainment, while complimentary wireless Internet access keeps you connected. Private bathrooms with shower/tub combinations feature designer toiletries and hair dryers. Conveniences include phones, as well as safes and desks. Pamper yourself with a visit to the spa, which offers massages, body treatments, and facials. You're sure to appreciate the recreational amenities, including a health club, an outdoor pool, and a spa tub. Additional amenities at this hotel include complimentary wireless Internet access, concierge services, and babysitting/childcare (surcharge). Getting to nearby attractions is a breeze with the complimentary area shuttle. Grab a bite at Eight, one of the hotel's 2 restaurants, or stay in and take advantage of the 24-hour room service. Full breakfasts are available daily for a fee. Featured amenities include complimentary wired Internet access, limo/town car service, and express check-in. Planning an event in Auckland? This hotel has facilities measuring 21520 square feet (1999 square meters), including conference space. Dining is available at one of the hotel's 2 restaurants. Public areas are equipped with complimentary wired and wireless Internet access. In addition to a full-service spa, Cordis, Auckland by Langham Hospitality Group features an outdoor pool and a health club. Event facilities measuring 21520 square feet (1999 square meters) include conference space. This eco-friendly hotel also offers a spa tub, a sauna, and a rooftop terrace. Concierge services, limo/town car service, and wedding services can be provided. Parking is available onsite for a surcharge. Cordis, Auckland by Langham Hospitality Group is a smoke-free property. Eight - This restaurant serves breakfast, lunch, and dinner. Guests can enjoy drinks at the bar. Reservations are required. The Lobby Lounge - This restaurant serves breakfast, lunch, dinner, and light fare. Guests can enjoy drinks at the bar. Reservations are required. A health club and complimentary bicycles are featured at the hotel. An outdoor pool and a spa tub are on site. Other recreational amenities include a sauna. Chuan Spa has massage/treatment rooms. Services include hot stone massages, facials, body wraps, and body scrubs. The spa is equipped with a sauna, a spa tub, and a steam room. A variety of treatment therapies are provided, including reflexology. Rollaway/extra beds are available for NZD 90.0 per night. Must book a stay in an Executive room or suite to receive benefits. Full details at check-in. Taxes and gratuity may not be included. Offer subject to availability. Other restrictions may apply.